The legendary Sheila E. will headline the third annual Women Who Rock Benefit Concert Presented by UPMC Health Plan and UPMC Magee-Womens Hospital on May 30th at Stage AE Pittsburgh. “I am so excited to headline this amazing and important benefit concert that supports women’s heath and women’s empowerment. Now is the time to stand up for all women,” states Sheila E.
Sheila E. has established herself as one of the most talented percussionist/drummers and performers in the world. She became a top session and touring musician before the age of 20, performing and/or recording with George Duke, Herbie Hancock, Billy Cobham, Con Funk Shun, Marvin Gaye, Diana Ross, Lionel Richie, Gloria Estefan, Patti LaBelle, and Stevie Nicks among others. 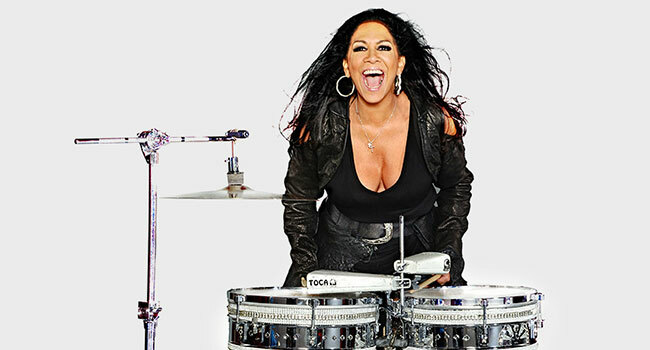 In recent years, Sheila E. has served as drummer of Ringo Starr’s All Star Band and musical director for the likes of Jennifer Lopez, Beyonce’ Knowles, and Prince. Her producing, arranging, and performance talents have been showcased on the Latin Grammy Awards, Summer Olympics, WOW Awards, ALMA’s, The Image Awards and the Academy Awards. Sheila was nominated for an Emmy Award for “Outstanding Music Direction” in recognition for her leadership as musical director for President Obama’s Performance at The White House: Fiesta Latina. Recently, she released a very powerful album, Iconic: Message 4 America which highlighted the same injustice’s from decades ago that we are facing today. This star-studded benefit concert features all female-fronted music acts, the powerful Women Who Rock award which will be presented to Sharon L. Hillier, Ph.D., the Women who Rock Rising Star Contest empowering the next generation of female singers/songwriters, the Beauty Bar, and the ever popular WwR auction. Proceeds from the Women who Rock Benefit Concert support Magee-Womens Research Institute, the largest research institute in the U.S. focused solely on women’s and infants’ health. More than 100 nationally recognized physician-scientists are engaged in groundbreaking research spanning diverse aspects of women’s health. Proceeds from Women who Rock Pittsburgh will be used to support world class women’s and infants’ health research through Magee-Womens Research Institute & Foundation’s campaign and will be designated to the Board Strategic Direction Fund (Fund #23001) for the Board of Directors to provide resources as needed. Tickets go on sale Friday, March 8th via womenwhorock.info.